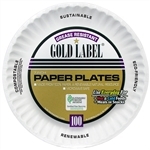 Disposable paper plates are a great choice for the environmentally conscious because they're biodegradable. We offer a selection of wholesale paper plates in cases of 500, 1000 and 1200. Bulk paper plates are easy to store for when they're needed and are a perfect option for use at food courts, cafeterias, cookouts, company picnics and more. You can choose from the lowest cost, plain white, uncoated paper plates that factor out at about 1.5¢ each (case of 1000), or go for patterned, ultra-strong, heavy-duty paper plates for about 16¢ each in the 10-inch size or about 13¢ each for the 8 1/2” size (cases of 500). We provide many other options of penny plates on offer in this category. AJM Green Label White Paper Plate 9 in. Smith Lee Rigideep Paper Plate White - 9 in. Dixie Heavy Weight Paper Plates - 5.82 in. Disposable Paper Plates are economical and better for the environment than plastic plates. Go green, buy paper plates.